We are a multifaceted service and products company serving Government, Agricultural, Automotive, Petroleum and Industrial sectors. Access Tile® FR meets ULC-S102.2 fire standard at less than 25 flame and less than 50 smoke. This ULC certified fire rating for Access Tile® FR is the industry’s first composite tile meeting the Ontario Building Code as well as the Standards Council of Canada requirements. 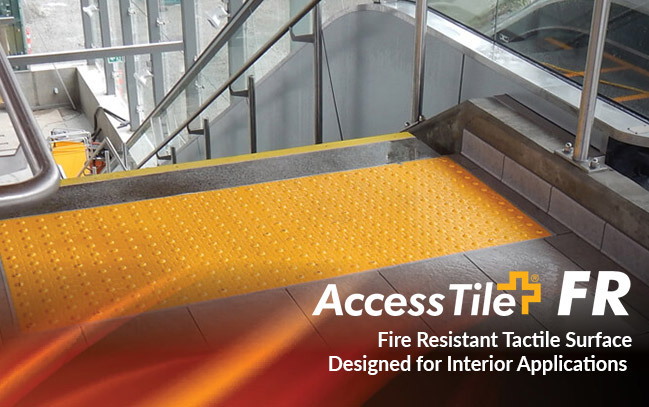 Access Tile® FR is the cost effective interior tactile solution for applying TWSI for tactile warning floor surfaces at exit stair wells, vestibules to exit stairs and lobbies, and corridors. Accu-Flo has provided goods & services to downstream oil & gas, transport, local, municipal, provincial and federal governments in addition to agricultural and industrial customers for over 30 years. With our products, electrical, and service divisions along with our expanded role of the manufacturing division, we will continue to serve our customers as we have since day one. Accu-flo started by servicing petroleum bulk plant meters but rapidly expanded its scope of work to include sales and service of some of North Americas top selling and performing meters. Custom Manufacturing and Technical Design products and installation services for Agricultural, Automotive, Petroleum and Industrial are built in our CSA approved facility. We are a full service facility and are able to provide Servicing and Inspection on behalf of Measurements Canada of liquid measurement and Related Products. While the accuracy of your measuring devices is your responsibility, Measurement Canada also plays an important role by enforcing standards of accuracy across the country. Several Alberta cities and municipalities have initiated a Water Meter Replacement Program that exchanges aging water meters with new, technologically advanced meters. To implement this program, local governments have partnered with Accu-Flo to supply and facilitate these meters. If you have received a letter from your city or municipality for your meter replacement, please contact Jamie Lemire at 1-877-883-2228.